An FBI operation in Miami has recovered a painting which is believed to be a Matisse stolen from a Venezuelan museum more than 10 years ago. 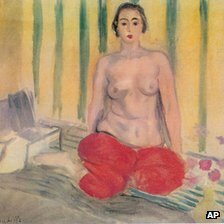 A man and a woman allegedly tried to sell Matisse’s Odalisque A La Culotte Rouge to undercover FBI agents. Pedro Antonio Marcuello Guzman, 46, and Maria Martha Elisa Ornelas Lazo, 50, have been arrested and charged with possession of stolen goods. The 1925 painting has been valued at approximately $3 million. The painting depicts a bare-chested woman sitting cross-legged on the floor wearing a pair of scarlet trousers. It was stolen approximately a decade ago from the Caracas Museum of Contemporary Art – formerly known as the Sofia Imber Contemporary Art Museum, or MACCSI. In 2003 the museum discovered the original artwork had been replaced with a forgery after an art collector reported it was being offered for sale in New York. A press release from the Department of Justice on Wednesday claimed Pedro Antonio Marcuello Guzman had agreed to sell the painting for $740,000 after admitting it was stolen. “Marcuello allegedly admitted to the undercover agents during a meeting that he knew the painting was stolen and offered to sell [it],” the statement said. The artwork was then brought into the US – from Mexico – by a courier identified as Maria Ornelas. “Upon inspection by the undercover agents, the painting appeared consistent with the original Henri Matisse painting reported stolen from the MACCSI museum,” the statement said. According to Reuters, the FBI’s National Stolen Art File database lists five other missing Matisse works, including a collection of 62 sketches. His 1906 Pastoral was one of five paintings stolen from the Museum of Modern Art in Paris in 2010. Earlier this year a Matisse floral still life, titled The Peonies, fetched $19 million at an auction in New York.